The constant runny nose in infants, children and adults occurs quite often with the arrival of winter and cold days. Inhalation of sinuses and flushing the nose with salt water are just some of the ways to defeat this annoying and not at all too favourable symptom of a viral infection. In our text will be based exclusively on natural methods of treatment, and we will share with you a proven recipes for this persistent condition. If you yourself have some interesting recipes and solutions to stop runny nose at home, without the use of standard drops and chemistry, feel free to leave the recipe below in the comments, we will publish it. Runny nose is usually one of the first signs of a cold. Although it can be very persistent, dull and hard, usually it is a completely harmless symptom. Watery, clear mucus from the nose is almost always a sign of a viral infection and is certainly not a reason to immediately reach out to pharmacies for strong antibiotics. There are no standard nasal sprays (decongestants) that are a right solution and should be used only as a last resort and only after consultation with the professional. These drops, which are available in several types in any pharmacy will quite quickly uncork nose and seemingly solve troublesome problem, but you should know that this will not clean your nose against viruses, nor will increase the mucosal immune response, but if you use them too long, you will create the opposite effect and have the feeling that you more often have a stuffy nose. 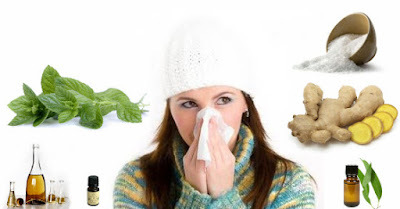 If you have uncomfortable sneezing and runny nose, and frequently wiping nose bothers you, you can try applying some proven folk medicines that can help mitigate and stop this annoying symptoms that in the cold winter days certainly inflicts more misery. In bowl pour a small teaspoon of sea salt and fill it with warm water, shake well and according to the instructions that came with your dish flush and do a nasal inhalation. To do this you need to pour water into one nostril so that it comes out through the other, along with all the impurities from the nose and sinuses. To the nasal mucosa a beneficial effect has hot water and salt. This method can help in case of persistent colds, sinusitis and allergies and is much more efficient than using the purchase drops and sprays. Do this 2-3 times a day and you will rarely wipe your nose. In addition to the above mentioned method, essential oils proved an excellent choice for nose and inhaling. Since we have found that runny nose in adults often occurs due to the discharge of secretions from the sinuses, and in this case, in addition to flushing with salt water inhaling steam with essential oils really helps, which has an excellent antiseptic properties and disinfects our airways and removes sinus blockage and expels piled discharge from the sinuses. It is best to use therapeutic essential oils of eucalyptus, pine, rosemary, mint, thyme, as well as menthol and camphor. Inhalation of the nose can be made with tea from fresh or dried basil, as well as the aforementioned sea salt. One of the most simple and long-used drugs for the sniffles which also stops water leakage from the nose is smoke inhalation from crust of bread, which is baked on the grill or hot plate. You definitely need to try this at your home. An excellent remedy for colds is a homemade brandy. This is a simple and very effective remedy for runny nose, which is equally good for nasal congestion. All you have to do is intermittent inhalation of homemade brandy. You just have to apply it under the nostrils and take deep breaths and nasal discharge will soon stop. Chewing fresh ginger root, is greatly beneficial for overall health, strengthening immunity, colds, and it can stop boring runny nose. You just have to take a piece of fresh root, peel it, wash it over running water and nibble on it for a few minutes, and then swallow. This should be done several times a day. It is known that vitamin C is an exceptional fighter against colds, flu and is an essential part of therapy for strengthening the immune system of our children, and also reduces the inflammation caused by constant runny nose. With smaller children and babies troubled by the nose and runny nose be sure to consult your paediatrician. Somewhat older children can feel free to take larger amounts of vitamins and minerals during the day. At the first sign of a cold they should take as many fresh fruits and vegetables rich in vitamin C (citrus fruits, cabbage, red berries, rose hip tea ...), and it is desirable to use a vitamin C powder or effervescent tablets. Also, zinc strengthens the immune system and thus can contribute to preventing water leakage from the nose. What certainly helps with mentioned problems is a room moisturizer. We know that the runny nose in infants, children and adults in the winter, during the heating season is caused by dry air, and it is important to set up on the radiator a humidifier in which you pour a few drops of an essential oil, for example tea tree, eucalyptus, mint and so on. If you can, get a good quality air ionizer. Sometimes runny nose and watery eyes occur at the same time, and the reason is increased eye irritation. Namely, our excess tears go into a sinus channels, after which they enter the nasal cavity. If it is a greater amount of tears, it will cause the release in the form of mucus which will again cause unpleasant runny nose.